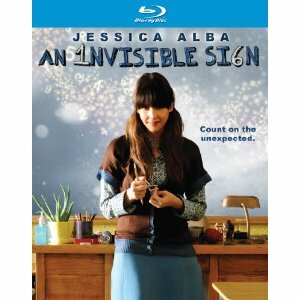 Based on the book “An Invisible Sign of My Own,” An Invisible Sign is a quirky comedy which weighed down by drama. Either that or it is a drama with a bit of quirky humor to keep it from being too depressing. And there is also a little bit of unexpected violence thrown in as well. Independent films are able to refrain from committing to any one genre, and An Invisible Sign enjoys playing in many at one point or another. Jessica Alba stars as an unconventional protagonist named Mona Gray. She lives within her own private world of numbers, unable to function normally in the real world. When her mother drastically gets her hired as a school teacher despite her lack of proper education, Mona finds a hidden skill in making mathematics interesting for children. She remembers her old math teacher and the gifts that he gave her with the education. Mona also remembers the personal disappointment she felt for her teacher, and begins a relationship with a particularly unique student. As Mona learns to live in the real world, she also discovers happiness outside of her head. Although the social interactions are awkward at first, Mona begins a relationship with the school science teacher (Chris Messina). The Blu-ray high definition helps enhance the visual effects which show the ways in which numbers take over Mona’s imaginary world, but there are no special features beyond the theatrical trailer.